Allergenic foods in bowls, still life. In the past several decades, scientists have seen a sharp rise in the number of life-threatening food allergies. Over the years, these effects have been attributed to a host of potential culprits such as the misuse of antibiotics to changes in dietary habits. Now, scientists have more definitive evidence that the gut microbiome plays a key role in the development of severe food allergies and could be exploited to prevent their development. Proof of this hypothesis came from investigators at the University of Chicago who found that gut microbes from healthy human infant donors transplanted into mice protected animals exposed to milk from experiencing allergic reactions. Conversely, gut microbes transplanted from infants allergic to milk did not. Findings from the new study—published recently in Nature Medicine through an article titled “Healthy infants harbor intestinal bacteria that protect against food allergy”—may inform research to develop microbiome-based therapies to prevent or treat food allergy. Scientists previously found that infants allergic to cow’s milk had different compositions of gut microbes than non-allergic infants. Previous studies also revealed that some microbes are associated with a lower risk of developing a food allergy, leading researchers to examine whether gut microbes of infants without milk allergy might be protective. Researchers transplanted gut microbes from each of eight infant donors into groups of mice raised in a sterile environment and sensitized to milk protein—meaning the animals’ immune systems created allergic antibodies to milk. When later exposed to milk, mice receiving no microbes or microbes from milk-allergic children produced allergic antibodies and experienced anaphylaxis, a potentially life-threatening allergic reaction. 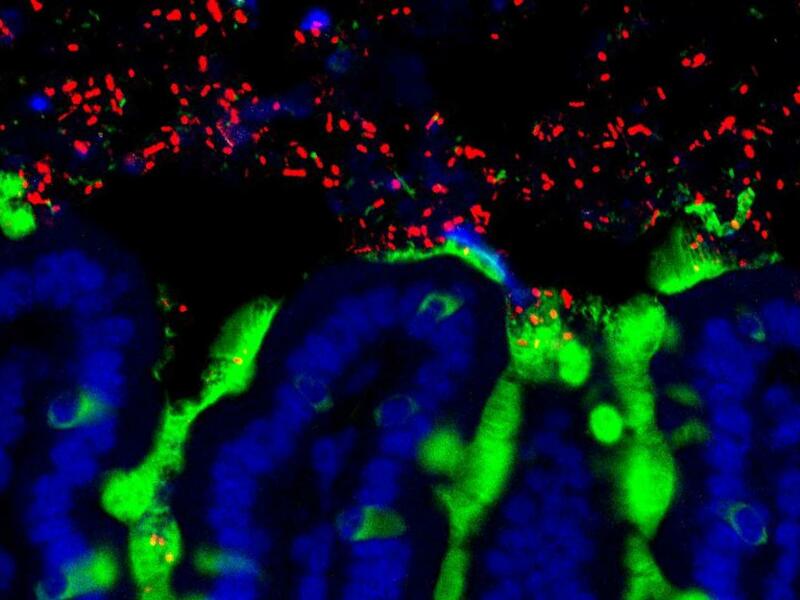 Mice receiving gut microbes from non-allergic infants had no reactions. Additionally, investigators then analyzed microbes in infant stool samples, finding many differences between the stool of infants who were allergic to milk and those who were not. Mice transplanted with microbes from non-allergic infants also harbored a family of microbes previously found to protect against developing food allergies. The research team sampled cells along the mice’s gut linings—where food allergies in mice and humans begin to develop. They found that mice that received microbes from non-allergic infants expressed different genes compared to those that did not, suggesting that microbes residing in the gut impact the host’s immune system.